Buy The Brain Architecture Game for $99. 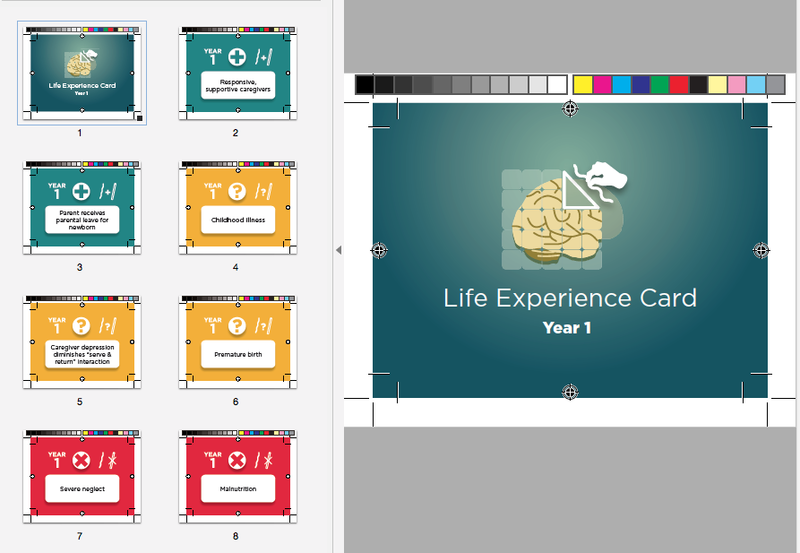 With this purchase, you will receive a download link to PDF files for years 1-8 of the Life Experience Cards that can be used to print either at home or with a commercial printer. Visit the Do-it-Yourself (DIY) Guide page to review how to complete your game kit. You will not receive any supplies in the mail through this purchase. Paypal OR credit/debit card (multiple countries), or online banking via Paypal eCheck (US only). Paypal is our credit card processor service regardless of whether you have an account with them. In most cases, an account is NOT needed. If you do not have a Paypal account, choose the second option below the Paypal login screen at checkout. It is labeled “Pay with an online bank account, debit or credit card, or PayPal Credit”. If your card is rejected, Paypal most likely wants you to create an account with your card for security reasons, but the error message will not state that. Upon payment receipt, we will send you a coupon to checkout for free with your personalized download templates. Our tax forms, including W9 can be found here. If you have more questions or problems, please visit our extended FREQUENTLY ASKED QUESTIONS before you email us. TRY FREE BEFORE YOU BUY! You can print the cards risk-free before you buy. For directions on how to print the cards, review our DIY Guide section “How do I print these at home?”. You can print up to 4 cards on a page through Acrobat Reader’s PDF printing functions.